Due to the enormous amount of pastries and biscuits I have consumed in recent weeks (not sure why) I have decided to dig out my Atkins book, ignore most of it but de-carb. Again. I do this at regular intervals and it really does work and as a sufferer of IBS I feel much better for it. Trouble is, carbs are my achilles heel and it only takes a brie and chutney panini to get be back on the slippery slope to Sunday morning croissants with a pain au raisin chaser. However, I have two big events coming up and I would like to look my best for them. 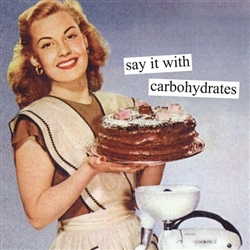 So the carbs have got to go. Alas, with a husband and three kids it is harder to actualise than you might think especially as I do NOT want my kids to know I am dieting (although as I am constantly on one diet or another, I imagine they won’t notice any difference!). So as I sit to plan the week’s meals I find myself centred around meat and veggies. No rice, pasta, bread or potatoes. *sobs* I can’t cut all the carbs in sauce type of stuff – just the basics for me. It’s not too bad in the summer (when there’s sun) as it is all salads and BBQs but the weather lady informs me the rain is coming back and miserable weather just makes me want to eat biscuits. I will compromise. No carbs (or wine) all week then Fri-Sun night I can eat what I like. This allows me pizza with the kids on movie night, a sandwich and a coffee in Costa on Saturday and a full Sunday roast. Potatoes, stuffing and all. There will be light at the end of the weekly tunnel!